About a year or so ago, I discovered Courtney Carver’s blog, Project 333. She wrote about how we wear 20% of our clothes about 80% of the time. I knew this to be true of the clothes in my closet, even when I was working in a traditional job in an office. Over the past year or so, I’ve donated more clothes than I care to admit. Clothes that I hadn’t worn in over a decade. Clothes I was given as gifts but had no interest in wearing. Business attire appropriate for an attorney, but not so much for a freelance writer working from home. Clothes that were my pre-pregnancy size 2. I’ve since come to terms with the fact that even if I did return to a size 2, I am not the same shape as I was before I had kids. Our whole family has been talking about taking on Project 333 together. I purchased Courtney’s micro-course on how to dress with less and build a capsule wardrobe and have been working my way through it. * Stephen is reading it, too. When we move to a smaller home, we will have less closet space as well. Which means we need to seriously pare down our clothes. And I’m looking forward to the challenge. With a renewed focus on simplifying and decluttering everything, including my closet, I think this project makes a ton of sense. The basic gist of it, is that you choose 33 items of clothing to wear for 3 months. The 33 items do not include things like pajamas, socks, underwear, workout clothes and loungewear. I have never given any thought whatsoever as to what goes in my closet other than whether the item fits and looks cute. I have never considered whether the piece I am buying works with the other items in my closet, where it was made, how it was made or anything else, for that matter. The more I read, though, the more I like the idea of buying clothes that are made in the USA, Canada or in countries that don’t abuse their workers. Or better yet from resale shops. Selecting your 33 (or 35 or 40 or whatever other number you decide) forces you to think about each piece. How do you wear it? Can it serve more than one purpose? Does it match other pieces in your wardrobe or is it a stand-alone item? In researching capsule wardrobes, I found Into-Mind which is a great site for thinking about how to mindfully put outfits together. I’ve also been following Bea Johnson of Zero Waste Home. Last summer she showed a zillion different ways to wear a long-sleeved men’s button down. This year, she’s doing the same with a long, black skirt. I haven’t finished selecting my 33 items, but I have chosen one of the workhorses. 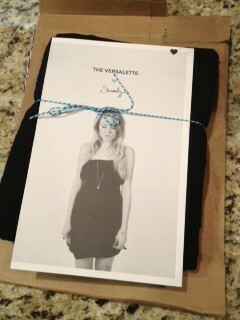 It’s a Versalette by Seamly. * It’s one piece that can be worn 30 ways. I just got mine in the mail, so haven’t had a chance to play with it yet, but it will take center stage in my capsule wardrobe. It’s made in the USA, from deadstock fabric and the story of how it came to be is fascinating. My neutral color will be black and I’m excited my Versalette works within that. Of course, the adorable model weighs like two pounds, so every style looks super cute on her. Pretty sure I won’t be wearing all 30 variations (the bubble skirt would make me look like a stuffed sausage plus I’m not in my twenties), but a lot of them should work. *I am in no way affiliated with any of these companies and am not receiving a referral fee for any of it. I just think they are helpful/great and am sharing it with you. This entry was posted in Uncategorized and tagged Clothes, Simple Year 2. Bookmark the permalink. Thank you for reminding me of Project 333. Wardrobe downsize/upgrade has been one of my major goals for 2013, and I’ve done the major work but gotten to a sort of plateau while I work on other things. You’ve inspired me to spend more time getting rid of clothes I don’t wear. I’ve had a massive wardrobe clear out and now have very little to wear. It certainly makes choosing outfits easier at the moment, and I’m looking forward to creating a fall/winter capsule wardrobe with much better quality pieces. I’ve been toying with the idea of doing the 333 challenge. I think I’m almost ready to take the plunge. Looking forward to reading more about the Versalette. I love the concept of a capsule wardrobe. I’m not at the right stage of life right now to do one, but by learning about it, it is helping me to choose my purchases more carefully. I did this with my children’s clothes as well and it has taken so much work and stress away. I do have to keep up with the laundry, but I have found that making sure I do laundry more frequently vs. letting it pile up to the ceiling has made it seem more manageable. My kids are at the age where they pick out their own clothes and they definitely have their favorites that they wear over and over…no need for the ridiculous amount of clothes that they used to have!! I followed this blog during Kerry’s year and am really enjoying your family’s journey as well. Thanks for the inspiration!! I’ve been doing this to we are looking at moving from about 1600 sq ft to about 1300 sq ft. I know it doesn’t seem like 300 sq ft is a biggie but it really is. I have 1 black skirt that I can change with a lot of different shirts. I love your blog (and loved the first year too)…you are very inspiring! I have a versalette and love it: I use it mostly vacationing. I cant wait to see the new improved version. now, a comment….the pictures on your blog are really small….is there any way that you can make them bigger? Thanks for the comment, Ali. Yes, I can definitely make the pictures bigger! Let me know if the next post (coming up shortly) is better picture wise. Might sound weird, but I have a Google doc listing every item of clothing I own. I occasionally go through and mark things to “ditch.” I haven’t done it in a while though, so now I’m looking. I think some of this stuff has already been donated and is still on the list. Oops. Just checked, and I have 26 t-shirts (some marked to go) which I rotate with the grey skirt and the brown skirt (soon to be grey skirt and black skirt, because the brown skirt is worn out and I have some black linen whispering in my ear), though I have 17 skirts total (9 of which are in the donate pile or have moved to the “scrap fabric” pile after becoming see-through, so I should remove them from the inventory). I just moved to within a block of a thrift shop. I should make a visit soon. I’m pretty sure I’m under 40 items for summer, that I actually wear. In winter, it’s the same 40 items, plus some long johns. I kind of want to move away from always wearing t-shirts from bands I listened to in high school, so I do have plans (and fabric) to sew a couple shirtwaists from vintage patterns. That’s sort-of related to the Sew Your Own Wardrobe for a Year Challenge, except that I haven’t bought clothing in over 2 years now, so it’s not much of a challenge to me! 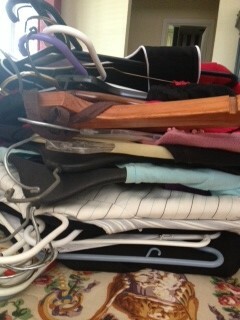 Now, this isn’t counting my living history wardrobe. That’s a separate thing with a separate closet, and the character has 3 gowns, 3 chemises, and 2 pairs of sleeves. There’s another gown planned along with a full Viking outfit as-historically-documentable-as-I-can-manage. Thanks for giving me a few things to check out! I’ve actually been thinking the last few weeks about how I need to pare down my wardrobe again. I usually have a few things I pull out when the donation truck goes by, but I need to take a harder look at what’s in there. I also need to work more on getting quality items into my closet, which is so hard with women’s clothing, it all falls apart so easily. Most of my shirts are now from the thrift store, and seem hold up better(especially since I’m not their first owner! ).